Would you customize a limited edition motorcycle? Moto Guzzi only built 600 units of the V11 Sport Scura, but that didn’t stop Kenji Katsumoto from tearing one apart. In his defense, the V11 Sport Scura isn’t very pretty. 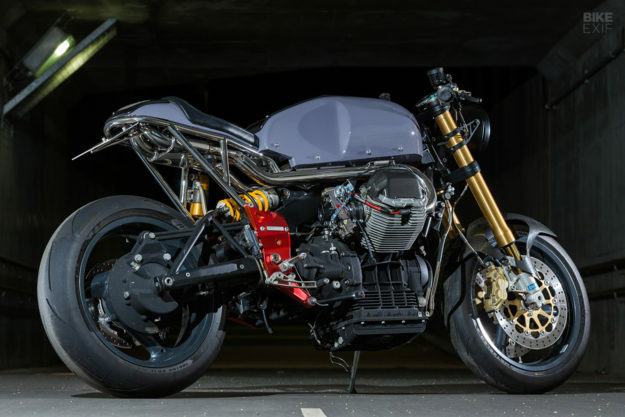 Launched in 2001 as an upgraded big brother to the V11 Sport, it came kitted with Öhlins suspension, Brembo brakes at both ends, its own bikini fairing, and a few carbon fiber bits. By all accounts it was a decent enough ride (though not exactly mind-blowing), but it was also porky and pricey. Styling-wise, it awkwardly straddled the line between a café racer and a sport bike. So the owner of this 2002-model V11 handed it over to Katsumoto-san, and tasked him with building something truly limited. Katsumoto-san’s background is actually Harley-Davidsons. He previously worked for a Harley dealer for twelve years, where he obtained Harley’s ‘Master of Technology’ qualification and specialized in metal work and paint. 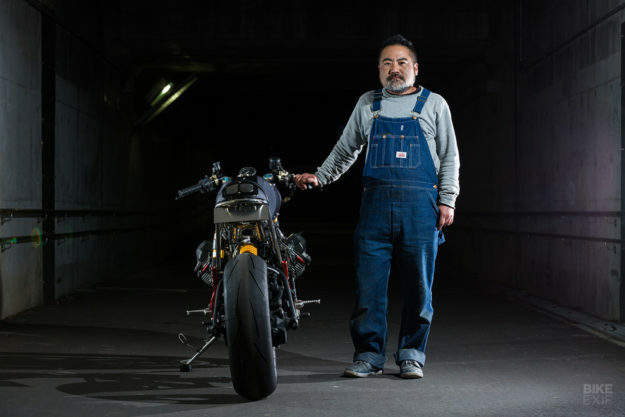 Then, just a couple of years ago, he decided to go solo, and opened Katsu Motorworks in Fukuoka, Japan. 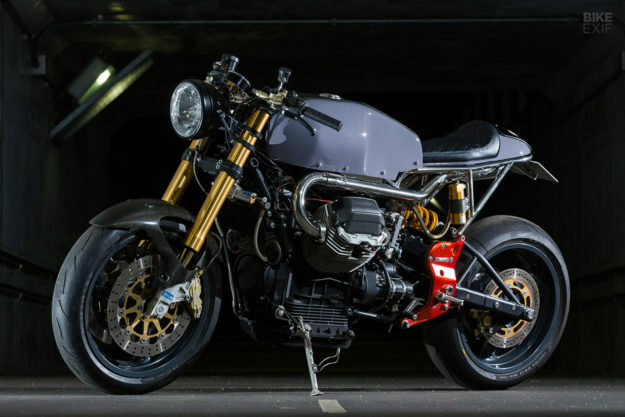 Now he builds everything from retro choppers to café racers and sport bikes. 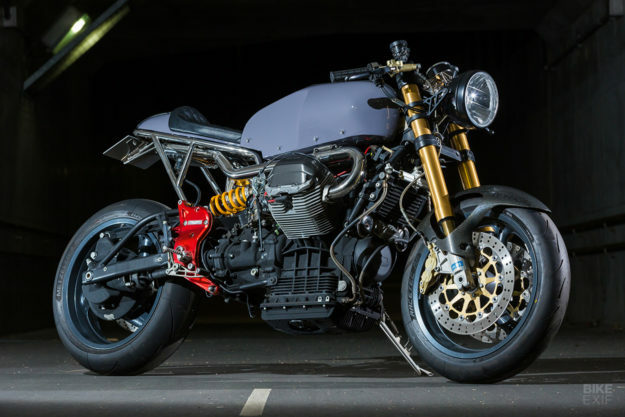 This V11 Sport Scura is his first Moto Guzzi build, and it’s an absolutely stellar debut. 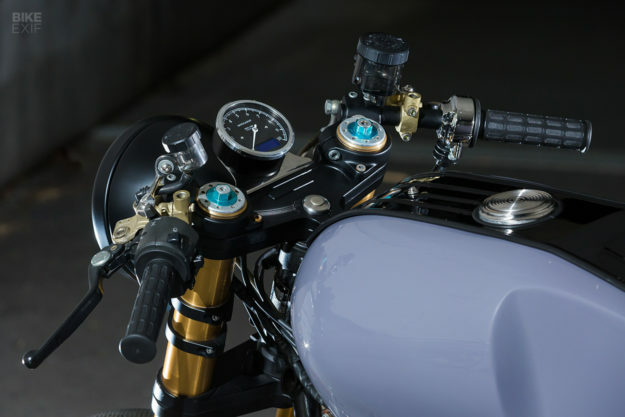 His client didn’t give him much of a brief—but he did say he wanted a café racer, with a particular Motogadget speedo and FCR carbs. 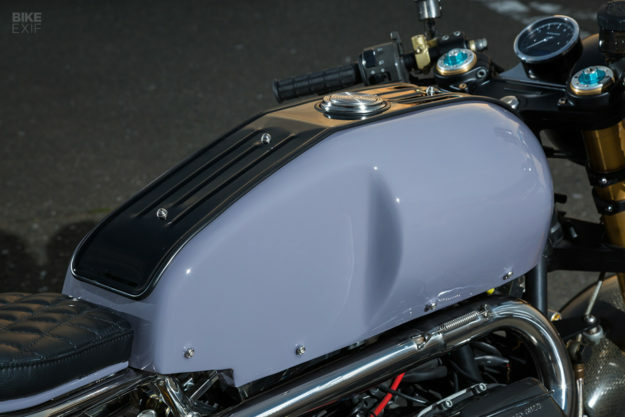 Katsumoto-san started by liberating the Guzzi of its bodywork—and its subframe. 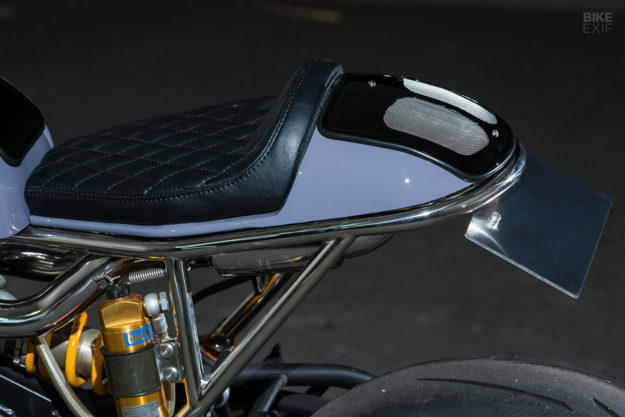 He then fabricated a new subframe from stainless steel, deliberately nudging the seat a couple of inches higher for a more aggressive riding position. And he spent countless hours sanding his welds down, so that he could give the frame a clean, polished finish. The next big job—and our favorite feature—was the stealthy exhaust system. Katsumoto-san hand-built the full setup from stainless steel, running the headers over the cylinders rather than under them. They converge in a silencer, hidden in the tailpiece and exiting behind two mesh screens. Everything was kept close to the frame and tank, and we’re told the mesh covers don’t affect performance at all. 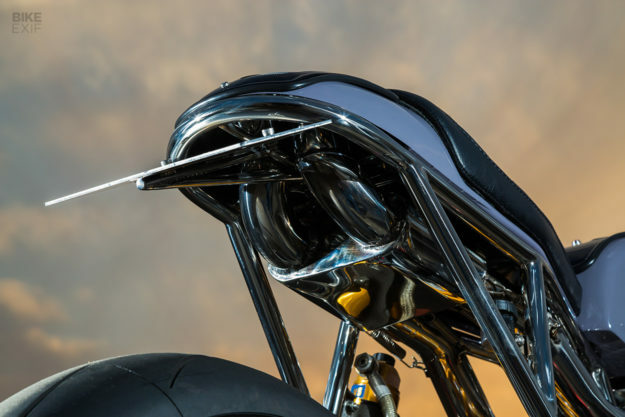 The fuel tank, seat and tail are all one-offs, shaped from steel. Katsumoto-san aimed for a more traditional café style than the Scura’s stock parts. He also built a new battery box, hidden away underneath the tank. The black panel on top of the tank looks like it’s been repurposed from someplace else, but it’s actually a custom piece. On the mechanical side, Katsumoto-san wisely left the stock wheels, brakes and suspension alone, simply adding some new Metzeler Racetec RR hypersport rubber to the mix. The motor and six-speed transmission are stock too, but the EFI system’s been swapped out for a pair of Keihin FCR41 carbs, as per the brief. They’re fed via a pair of stubby velocity stacks. Up top, the Guzzi’s finished off with a classic Daytona headlight, a Motogadget speedo on a custom bracket, and Tommaselli grips. Katsumoto-san didn’t throw away all of the Scura’s ‘limited edition’ bits; you can still spot its red heel plates and carbon fiber front fender. With everything ready to be buttoned up, Katsumoto-san shot the tank and tail in a warm grey, infused with a bit of violet. 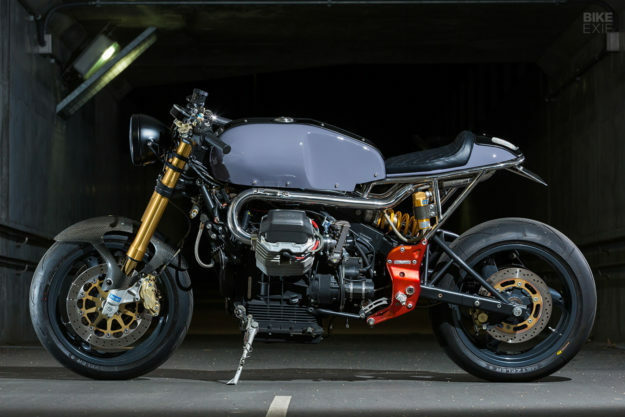 The result is a slick café racer that keeps the Scura’s best parts, and trades up its worst parts. And with those fat carbs and exquisite exhaust, it should scream as good as it looks.